Great Ormond Street Hospital said moving Charlie home would not be practical. TERMINALLY ILL BRITISH baby Charlie Gard should be allowed spend his final days in a hospice, a court heard today. However, a dispute continues over his care plans. Charlie’s parents had wanted the 11-month-old baby to spend his final days at their home in west London after losing a legal bid to take him to the US for experimental treatment. They accepted that their son has to be moved to a hospice, but hopefully just for “a week or so”. The case has generated international interest and drawn the attention of US President Donald Trump and Pope Francis. But Great Ormond Street Hospital (GOSH), where Charlie is being cared for, said that moving Charlie home for his final days would not be practical and suggested instead that the baby be moved to a hospice. “GOSH has found an excellent hospice willing to assist that would afford Charlie and his parents the space and privacy necessary to protect them all,” the hospital said in a statement. The hospital argued that it could not provide round-the-clock care for the baby in the couple’s home and that the “ventilator does not fit through the front door”. It also said that despite several enquiries, it had been unable to find any other medical facility “prepared to accept Charlie for end of life care”. The parents and hospital are still at odds, however, over the detail of Charlie’s care plans and were given until tomorrow to come to an agreement. The couple fought a long legal fight to allow them to take their child out of GOSH and fly him to the US, but lost a series of appeals in British courts and the European Court of Human Rights in Strasbourg. Their legal battle led to offers of help from the US and the Vatican, leading the hospital to ask the courts for a final assessment of any new evidence. The parents abandoned their latest court case on Monday, with their lawyers telling the court that “time has run out” and that they had made their decision after seeing Charlie’s latest brain scans. Charlie suffers from a rare form of mitochondrial disease, which causes progressive muscle weakness in the heart and other key organs. Email “No agreement over where Charlie Gard will spend his final days ”. 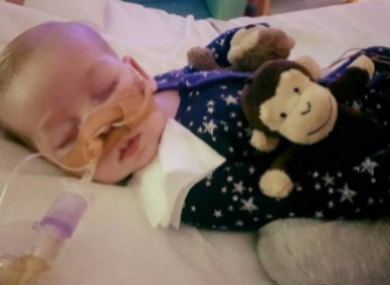 Feedback on “No agreement over where Charlie Gard will spend his final days ”.